Congress is investigating the NRDC gang’s China advocacy, but the NRDC China connection is hiding in plain sight for those who know the Rockefeller family. The Hill tells us House Natural Resources Committee Chairman Rob Bishop (R-Utah) and Rep. Bruce Westerman (R-Ark.) have written a letter to the National Resources Defense Council (NRDC) asking why it is advocating for Chinese interests over US interests. The letter itself may be found here and it’s quite well done, better than I hoped, raising several great questions about why the devil the NRDC is so deeply committed to China’s welfare, compared to ours. Curiously, though, the letter doesn’t address what should be well known about the NRDC China connection. The Committee is concerned about the NRDC’s role in aiding China’s perception management efforts with respect to pollution control and its international standing on environmental issues in ways that may be detrimental to the United States. The NRDC’s relationship with China has many of the criteria identified by U.S. intelligence agencies and law enforcement as putting an entity at risk of being influenced or coerced by foreign interests. The NRDC’ s involvement in China spans two decades and represents a significant investment of time and resources. The NRDC’ s ability to work in China is dependent on the goodwill of the Chinese government. The NRDC leadership regularly meets with senior Chinese and Communist Party officials. NRDC press releases, blog posts, and reports consistently praise the Chinese government’s environmental initiatives and promote the image of China as a global environmental leader. When engaging on environmental issues concerning China, the NRDC appears to practice self-censorship , issue selection bias, and generally refrains from criticizing Chinese officials. For instance, a widely reported 2016 study by Greenpeace concluded that China’s government subsidized commercial fishing fleet threatens the viability of fisheries around the world. Just months after the Greenpeace study was released, the NRDC praised China’s “bold new reforms” on domestic fisheries emphasizing that “China has been the world’s largest producer of wild fish for over two decades.” Similarly, the NRDC has never condemned, or even mentioned, China’s illegal and environmentally destructive island reclamation campaign that has covered over 3,200 acres of coral reefs with runways, ports, and other military facilities. Of note, the NRDC collaborates with Chinese government entities that are deeply involved in Chinese efforts to assert sovereignty over the South China Sea in contravention of intemational law. By contrast, the NRDC takes an adversarial approach to its advocacy practices in the United States. In fundraising materials, the NRDC claims to have “sued the [U.S. government] about once every ten days” since President Trump was inaugurated. Over the last two decades, your organization has also sued the U.S. Navy multiple times to stop or drastically limit naval training exercises in the Pacific arguing that naval sonar and anti-submarine warfare drills harm marine life. We are unaware of the NRDC having made similar efforts to curtail naval exercises by the Chinese People’s Liberation Army Navy. Following the U.S. withdrawal from the Paris Agreement, the NRDC sought to shape public opinion, in part, by attempting to discredit those skeptical of China’s commitment to pollution reduction targets or to honestly reporting environmental data. The disconnect between the NRDC’s role as “thought leader and trusted adviser to our partners in China” and its approach to environmental advocacy in the United States is disconcerting. These are serious matters. The Congressman have heavily footnoted their letter to back up each and every claim. Yet, they haven’t (perhaps for strategic reasons) touched upon the obvious foundation of the NRDC China connection. It’s the special interests of the Rockefeller family, which include not only making a wilderness of Upstate New York and environs but also pursuing interests in foreign investments. The NRDC is, essentially, a Rockefeller enterprise. It was founded by John Adams, a bat boy for the family team, who continues to be affiliated with the organization as well as its Open Space Institute and Catskill Mountainkeeper spinoffs, the latter being a plaything for his son Ramsay and the former being headed by Rockefeller descendant Kim Elliman. 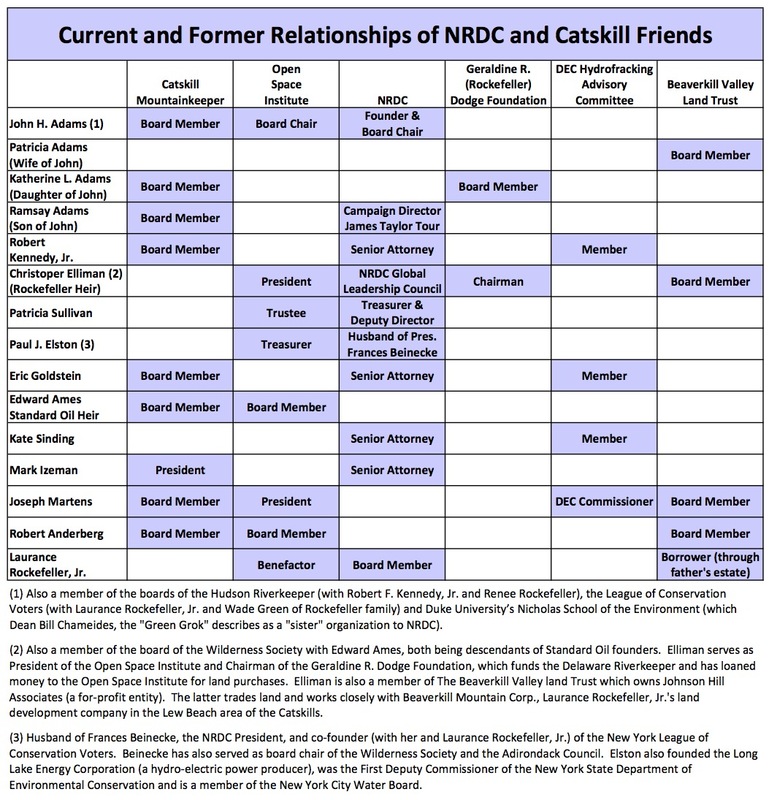 Larry Rockefeller, Jr. is also involved, of course, and the family as a whole funds numerous other fractivist enterprises who collaborate with the NRDC gang. The NRDC does absolutely nothing that is not wholly aligned with the Rockefeller family agenda. They’re family, after all (see also this NY Post summary). This is a chart I assembled five years ago to accommodate the EID article linked above. It show the Rockefeller family connections to NRDC at the time. Edward Ames was Trustee for the estate of Mary Flagler Cary, granddaughter of Standard Oil partner Henry Flagler. Steven C. Rockefeller, Jr., is Chairman and CEO of Rose Rock Capital, a family-owned holding company dedicated to fund management and real estate development in China. Family leadership is shared by his son, Steven III, and his nephews, Collin Eckles and Landon Eckles. The company’s current primary focus is on development, in partnership with Tianjin Innovative Finance Investment Company Ltd., of the Yujiapu Financial District in Tianjin’s special economic zone. Prior to founding Rose Rock, Mr. Rockefeller worked with numerous start-up companies across a range of industries, often serving on the Board of Directors. Industries represented by his focus included green energy and technology, educational television, specialty pharmaceuticals and robotics. Rockefeller has set up a venture with Tianjin Finance Investment Co to launch the funds, which aim to raise 5 billion yuan initially, including 2 billion yuan by the end of this year, the newspaper said. Rose Rock, which controls 90 percent of the fund management venture, will be responsible for daily management and operation of the funds, while its Chinese partner will focus on government relationships, the article said. Money raised will be used to build a landmark commercial property project in Tianjin’s financial district, while future investment will expand into other areas including infrastructure, culture and education, the newspaper said. That infrastructure, I pointed out, was a new petrochemical import terminal in Tianjin, “the first time in history” a Western company had a stake in a Chinese petrochemical port. “Rose Rock Infrastructure, Ltd. Is a subsidiary of Rose Rock Partners, LLC and is dedicated to development, ownership and management of infrastructure assets in China.” It has joint venture offices in Beijing, Tianjin and Hong Kong. New York-based Rockefeller Capital Management, formed through the acquisition of family office Rockefeller & Co. by its management team as well as an investment fund from Viking Global Investors and a Rockefeller family trust, officially launched last week, with $18.5 billion in assets under advisement in its existing asset management and wealth management businesses…. Viking owns a majority stake in the firm, while the trust representing the family owns about 10 percent. The firm’s board also includes Rockefeller family members David Rockefeller Jr., son of the family patriarch who died in 2017, and Peter M. O’Neill, a Rockefeller heir who has long overseen the family’s investments. 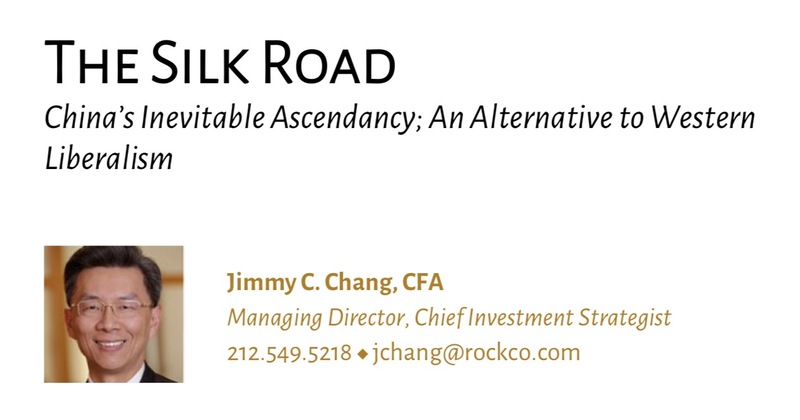 The article, to be fair, is much more fair and balanced than the subtitle, but the point remains; Rockefeller Capital Management is focused on China. And, the NRDC being a Rockefeller project, this is the real NRDC China connection. It’s also the one Congress ought to be investigating as it properly digs into the way 501(c)(3) tax-exempt organizations are being misused to advance private special interests. It’s the same with everything the supposedly “charitable” Rockefeller family does. The time for busting up this cartel is long overdue. Great article. The actual letter is a good read too. China is almost single handedly ruining the planetary environment from carbon in the air to plastic in the ocean. Chinese leadership understands the benefits of PR and a good team of shills. I hope this very well documented letter puts them back on their heels a little…but I doubt it. They love litigation.